Consider Edgartown a one-stop shop for deals, dinners, drinks, and donations all weekend long. The town will host its sixth annual Pink and Green Weekend starting Thursday, May 11, and running through Sunday, May 14. The four-day event combines celebrations of spring and Mother’s Day, and was organized and sponsored by Edgartown Board of Trade. Main Street storefronts will be kicking in with deals, so grab your mom, throw on a pink or green shirt, and take full advantage of these weekend-only specials. 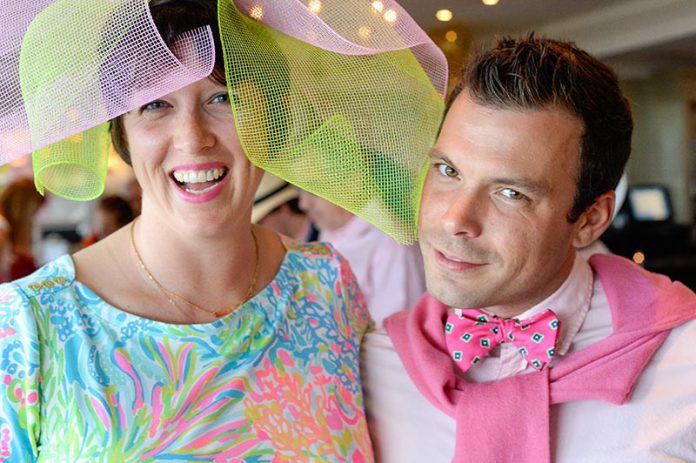 Stefanie Wolf Designs is offering 10 percent discounts to people wearing pink or green. Sale items are included, and the deal runs all weekend long. Also stop in to enter to win a special gift, no purchase necessary — the drawing will be Sunday. The MV Boy’s and Girl’s Club’s Second Hand Store is also offering deals to those who are wearing their spirit. Wear anything pink or green, and save 25 percent. Wear both pink and green, and it’s “buy one, get one free” for anything in the store. Free door prizes are offered every hour, and the store is serving complimentary coffee, tea, and snacks. Swing by for these deals on Friday and Saturday. Bring mom to Sea Spa Salon this weekend for a Mom and Me Spa Day. Treat yourselves to 35 percent off all nail and spa services. Backwater Trading Co. is also offering something special. Spend $75 or more and receive a free Mother’s Day gift bag. The sale also runs from Friday through Sunday. Katydid’s deal of the weekend is a free pink or green Coobie Bra with the purchase of three. Suka is running a 10 percent off storewide sale all weekend long, and so is Vintage Jewelry. Past & Presents is the perfect place to get ideas for refreshing your home this spring. Shop their furniture and accessories and receive 15 percent off Friday through Sunday. Get your classic Martha’s Vineyard T shirt at Shirt Tales this weekend, where they’re offering 10 percent off their pink or green clothing. Claudia Jewelry is also offering 10 percent off its pink or green accessories. Wheel Happy is offering a deal on spring tuneups this weekend only. Bring in your bike and get it ready for the season for $35 instead of $50. Chesca’s will be mixing up pink and green hibiscus margaritas all weekend long, starting Thursday. Stop in for a sip, sit on their outdoor porch, and always remember, it’s five o’clock somewhere. Try a $8 “Pink Eddy” or “Pearl Harbor Martini” served all weekend at the Newes from America Pub at Kelley House. Don’t miss Lucky Hank’s three-course pink and green event on Friday from 5 to 9pm. The restaurant and cafe will donate 10 percent of food sales to Family Planning MV. The MV Food and Wine Festival always seems to be buzzing about the same weekend, making Edgartown even more of a destination than it already is. From “Real Men Drink Pink” to the Grand Tasting at Kelley House, there are plenty of events for everyone in your party. For a full listing, visit themvwinefestival.com. When you inevitably end up at the Black Dog on Main Street, do your deed of the day and make a donation to Angels Helping Animals animal shelter. The Island-run nonprofit works to find animals permanent homes. Don’t miss Donaroma Nursery’s signature birthday celebration. This year it’s hosting a “1977” 40th birthday party from 4 to 6 pm that includes a DJ, trivia, prizes, refreshments, and fun surprises for all. Ready or not, the beginning of the season is here, and Edgartown’s getting its first taste of it this weekend.